This is my first biplane. I admire the classic lines of the Super Stearman, which is a modified version of the original Boeing-Stearman Model 75 . 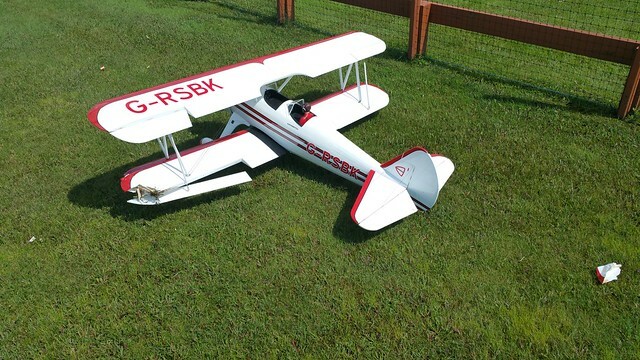 A friend at the flying club has this model and when a new-in-box kit became available at a good price it was time to get one for myself. I found the overall quality of this kit and the manual to be high. Tolerances and covering were good and the airplane went together well. Extra touches like the pre-installed aileron servo fishing strings and the markings on the firewall for the cowl ring tabs were much appreciated. 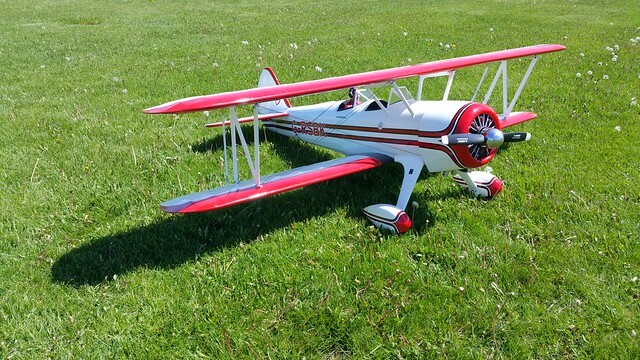 This was my first airplane from Great Planes and I would buy another. Some of the hardware was a little on the cheap side. It was replaced with better quality stuff. A great day for a maiden flight. It took almost half an hour to get everything unpacked and assembled at the field. I had a friend look everything over and he also acted as my spotter and trimmer for the first couple of flights. After a short takeoff run the plane leapt off the ground and stooged around nose-high as if tail heavy. I had checked the CG before and did so again at the field and I may yet add some nose weight, but in the interim 12 clicks of down elevator solved the problem. The engine was a little lean in the top end; it sagged and threatened to quit when I throttled up after a low-speed pass, so I richened it an eighth of a turn after landing - that solved the problem. It still pops a bit in the mid range so I am leaning out the low end a tiny bit after each flight. The DLE 20 is an excellent match for this airplane, which cruises between 1/3 and 1/2 throttle. A ten minute flight uses about 90 mL from the 330 mL gas tank (27%). The aileron throws were too high at first - I dialed those down a little after each of the first two flights. 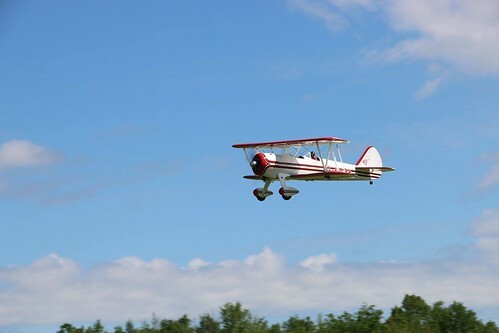 By the third the Stearman was flying beautifully; it is a joy in the air and hasn't shown any nasty tendencies. I checked before disassembly and was very pleased to find that the plane fits into my truck fully assembled. I was also able to carry it assembled into the basement and set it on the stand. This will cut down on non-flying time on trips to the field. I recharged the single 2500 mAh A123 battery when I got home; for 27.5 minutes of total flying I put 550 mAh back into it. This gives me more than enough capacity for an event or a typical day of flying. For photos of the plane at the field and in flight, visit my Great Planes Super Stearman - General album. I took the plane to the field for the third time last Sunday. I was a far warmer day than for previous flights. The engine was missing occasionally, and suffered power loss around the five minute mark, causing one dead stick and a couple of quick landings. I did some research online and decided to increase the spark plug gap to 25 thousandths of an inch. I also opened up the cowl a bit to allow more cooling of the cylinder head. The plug gap solved the miss, but the power loss remained. It would run fine on the ground but shortly after takeoff it would lose power. I tried opening the low needle a little before each flight and I ended up opening it a total of 3/8 turns, which solved the problem completely. 2017-07-17 Two days later I smacked the fence good and hard on takeoff. 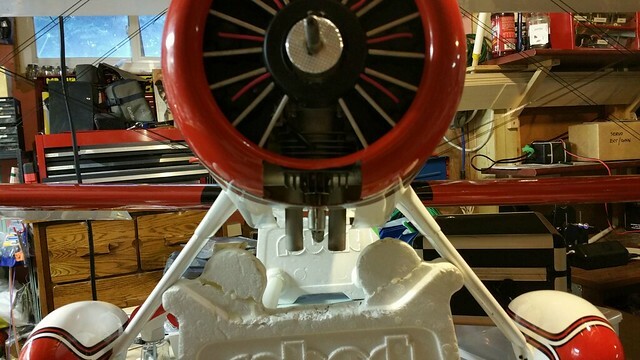 I repaired the plane over the winter of 2018/19 - see Repairs.